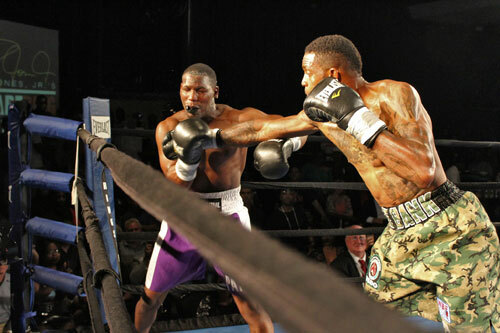 Claridge Radisson Hotel, Atlantic City NJ - Beloved local favorite, southpaw, Derrick “TAKE IT TO THE BANK” Webster, Glassboro, NJ, deposited right hooks and straight lefts directly into Lamar Harris’s, ST Louis, MO, mug, earning a second round technical knockout, Saturday night. Bedecked in camouflage trunks with a matching zippered warm up vest Webster, 167.8, was accompanied into the arena by all-time great Roy Jones Jr.. Ascending the stairs and climbing through the strands, Jones literally was busting a rap about his career. Not an impromptu spur of the moment by Jones, this verse had a studio produced soundtrack. Bearing a facial resemblance to one-time Philly brawler and recently sprung Frank “The Animal” Fletcher, Harris, 167.9, rushed Webster against the ropes and released his fists for the initial twenty seconds. Tactically stepping to the side and returning the action to the center of the ring, Webster began pumping a stiff jab off Harris’ face. As of late, the one time dance master Webster is fighting more flat footed which creates much more bang in his punches. Cornered and hurt by a right hook to the side, Harris ate resin dust after Webster landed a straight left to his head at round’s end. Between stanzas the tall lean muscular and tattooed Webster stayed on his feet. It did not take long for the stalking Webster to finish Harris. After being staggered by a straight left and backed into a corner, Harris absorbed Webster’s entire onslaught. When referee Shad Murdoch stepped in to stop it at twenty eight seconds, Harris cornerman Richard Schwartz protested the closure while sitting on his stool. It was a good call by the referee, no need to let a beat down become a slaughter in this scheduled eight rounder. 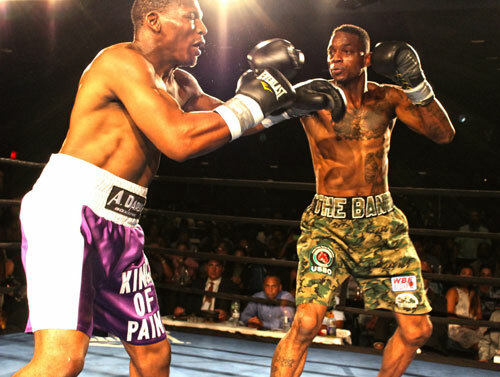 Following, Webster called out WBA Super Middle King George Groves of the United Kingdom. “I am looking for a title. I want George Groves,” Webster said. Keeping active, Webster has won five in a row, three by kayo since June of 2016, and his record now stands at 24-1, 13 KOs. Harris dips to a unflattering 9-14-4, 5 KOs. 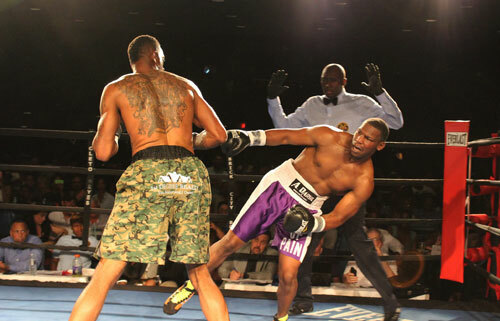 The semi-wind up had Prince Badi Ajamu, Camden, NJ, return to the fight game. Following eight years of inactivity, the Price shook off accumulated rust, earning a unanimous eight round nod against Edgar Perez, Chicago, IL. Winning every exchange and all the rounds, Badi, 191.4, won by scores of 79- 73 and 80-72, twice. Badi’s mark rises to 28-3-1, 15 KOs. Weighing in at 190, Perez fell to 7-22, 3 KOs. World ranked heavyweight Zhang Zhilei, Zhoukou, China, destroyed Nick Guivas, Topeka, KS, in two minutes forty three seconds in the evening’s only scheduled ten round match. A 2008 Olympic Silver Medalist, Zhilei, 254.8, beat the crap out of Guivas 238. Taking a knee after getting tagged by a right hook, Guivas was dropped again moments later, and referee Murdoch waved it off. Looking to raise his stock, Zhilei remained undefeated, 17-0, 13 KOs. For personal health reasons, Guivas should not face boxers of Zhilei’s caliber, but does live to fight another day with a deceiving 13-8-2 record. 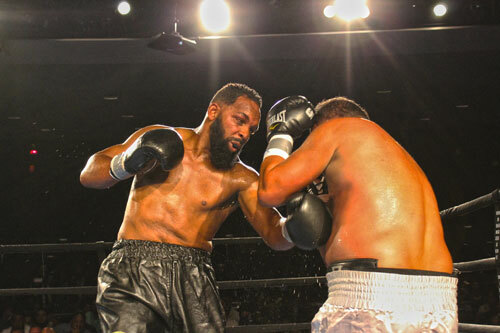 Thirty one seconds of mayhem ended when super middleweights Lamont McLaughlin, Philadelphia, fell like a sack of potatoes, after taking two rights to the side of his face from Tahlik Taylor, Freeport, NY. McLaughlin, 167.2, and Taylor, 172.8, toed the line and unloaded bombs from the onset, And then it was over. McLaughlin, still looking for his first win, is 0-2. An overjoyed Taylor sports 2-7, 1 KO record. 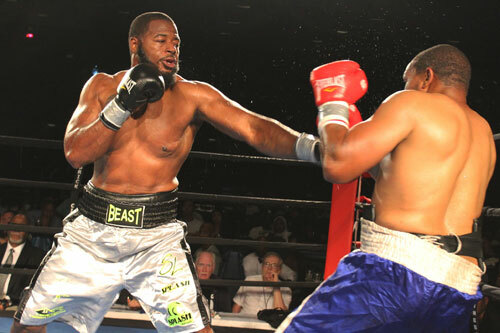 Cruiserweight Mike Hilton, Trenton, NJ, was extended the distance for the first time in his career by awkward Willis Lockett, Takoma Park, MD. Lockett’s frustrating style won him a couple rounds on one judge’s card, en route to losing a unanimous six round decision to Hilton, 198.5. Weighing in at 194.6, Lockett might be better than his 14-21-6, 5 KOs slate indicates. Hilton remains undefeated 7-0, 6 KOs. The judges scores were 60-53, 60-54, and 58-56. Shaddy Gamhour, 163.5, Pensacola, FL, kayoed Jessie Singletary, 167.3, Washington DC, at 1:43 of round one, in a scheduled four. Gamhour 4-0, 3 KOs and Singletary 0-3. Fight cards always sell out at this venue that holds just six hundred fans. These shows are always lively and tonight the house was entertained by a female rapper out of Camden during one break. Mis Downing Promotions and Square Ring Promotions delivered the night's affairs.